You are here: Home / Uncategorized / Thank You for Reading! This site was started two years ago when my work environment changed from going into in a corporate office each day to working from home. It was intended as a way to motivate myself to put on an ‘outfit’ instead of my pjs/workout clothes each morning. I really only thought that my best friend, sister and mom would ever stop by. But because of the magic that is the internet the site grew far beyond my immediate circle and I have had the pleasure of crossing paths with so many people I would never have encountered. It has been a fantastic experience to share and discuss and learn through this medium with all of you. I can’t express how much I’ve appreciated the sweet, thoughtful and helpful comments and emails I’ve gotten over the past two years. So as a fun way to start off year three of blogging I wanted to do something to say THANK YOU to all of you lovely people out there who read this blog. I’m going to give away three $100 gift cards to randomly selected people using the rafflecopter form below. Just enter before midnight January 19th and I’ll pick three random winners on January 20th. How fun! I love contests!! I love following your blog – we have a very similar style, so you are great for inspiration!! I love your outfit posts – they are so inspiring for my closet. Great sense of style! Thank you for the giveaway 🙂 I have enjoyed your blog so so much. Hi! Love your blog, very inspiring!! I found your blog a while back because you have the same Old Navy dress as me. I was look for new ways to remix my dress and your remixing skills are amazing. Love the inspiration! Thanks so much for the giveaway! I have used many of your outfits as inspiration for my own. Thanks for your hard work! What an amazing giveaway! 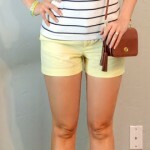 Love your outfits – especially when you use the mustard and chambray pieces! I'm glad I found your blog a few months ago. At that time, I was trying to figure out how to match the different colors. You gave me tons of ideas! My favorite outfit is the yellow pencil skirt with the navy blue polka dot shirt. I absolutely love your one suitcase series, and seeing the different ways you wear one item. Please keep blogging! Love your blog and am a faithful reader! Thanks for the great posts and the giveaway! Congratulations on your anniversary! I've been following for a few months now after seeing some great inspiration on Pinterest. Love your look! How fun! I check your blog daily! Love your classy style! Your blog is great–I've been following for almost a year. I follow using feedly, and enjoy trying to match things in my closet. I loved your review of items from 2013. Would you consider doing a post about the must-have items for 2014? Items you think you'll be wearing a lot to give some of us ideas of things to add to our shopping lists? Your blog is fantastic, and I am so impressed that you get so dressed up to work from home. That is amazing! I found you on Pinterest from one of your suitcase posts and loved your style, have been following your blog ever since. Congrats on 2 yrs! Love your blog – its one of the few style blogs I've found that isn't preachy or pretentious or requires I wear leopard + hot pink + 6 inch heels every day. I love following your blog; you're such as inspiration! Congrats!!! You've helped me immensely to look more put together! LOVE your blog and style! Thank you for sharing! I love your blog! I've gotten lots of inspiration from your outfits. Fantastic blog – massively helped me pack for a trip to Europe. I don't miss a post! Congratulations! I love your blog and keep up the great work! I only found your site a few months ago. Love it! And thank you!! I recently found your blog. Thanks for the great inspiration and outfit ideas. I love looking at the outfits you put together each day. It's very motivating to switch up my outfits! Hello from the other side of the globe 🙂 Your posts very relevant to my work environment and very inspiring. I specially love your suitcase posts. They have helped me pare down when I travel. Keep it up! I enjoy your blog! Thanks for the giveaway! I hope I win! Thanks for the great outfit ideas! Hi 🙂 I've really enjoyed reading your blog for the past year or so. Thank you. I really love your blog! The way you organize the posts is SO helpful when I'm looking for inspiration. As a 32-year-old mom of three, I really connect with your tasteful age-appropriate but still trendy & fun style. Thanks for the opportunity! Thank YOU for helping a new professional develop and remix a professional wardrobe! You are amazing 🙂 so excited for year three! Found your blog in January 2013, when I was home after shoulder surgery. I went back to work the following week, and have not work tennis shoes, or a sweatshirt once. I also upgraded to skinny jeans, cardigans, and (gasp) a few skirts. Thank you! Thanks to you, I look at my closet differently now. I also shop smarter with different work-related outfits in mind. Keep it up. Love your site. I especially appreciate your one suitcase posts! I check in with you every single morning for inspiration! I love your style and your tastes seem similar to mine. Very excited to participate in this! You are one of my favourite blogs. Loved seeing all your great outfits this past year! I especially like how you've grouped them to show several ways to wear the same piece of clothing! I read your blog daily and I'm using your beach vacation suitcase post to plan an upcoming cruise. Thanks! I get so many great work outfit ideas from your site. Thank you!! I really enjoy your blog MK! Ive been reading it for a year or so now and it has helped me dress better. I no longer wear only old navy jeans and t shirts! Yay! Love your blog! 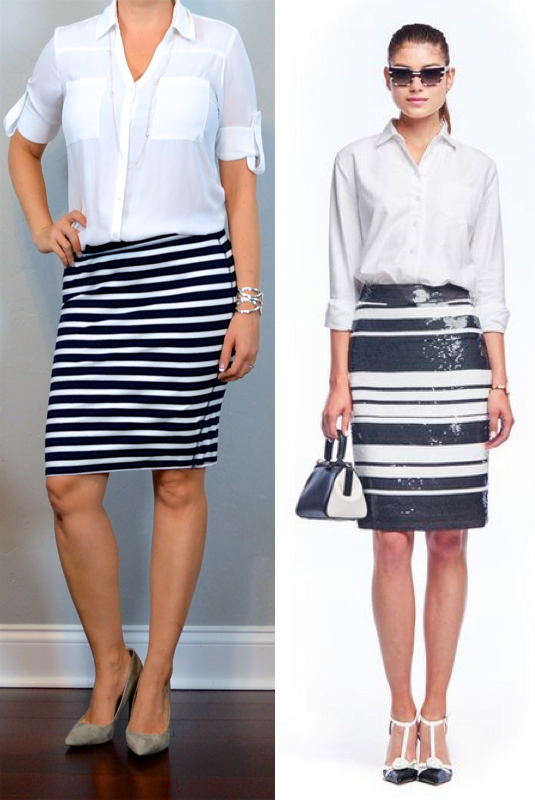 Love creating new outfits for work with ideas from you…thanks! Congratulations! On three years and counting! I'm a very visual person so once I stumbled onto this site it was an answer to prayers. I do however miss the select by color feature. Love your posts! Congratulations on three years! I'm a teacher and absolutely love your blog! Your outfits are accessible and timeless. I love that you post outfits that I could wear to work and I love your posts with different ways to wear a certain item. love your blog! yay for a giveaway! I enjoy your blog very much, even though I'm old enough to be your mother. As a matter of fact, you share the same birthday as my son, except he's one year younger. And I also work from home and try to stay in the work mode by dressing for work instead of wearing PJs or weekend clothes. Congrats on the anniversary. Keep all the great outfits coming! Just found your blog a few months ago! Loving the outfit inspirations and learning to coordinate colors I never thought possible. THANK YOU!!!!! I started my blog 8 months ago and have enjoyed it so far. I write more about my relationships but I have used your blog as inspiration for getting ready for work in the morning! I'm a teacher and get a lot of great ideas from your posts! Love your posts!! Thanks for the giveaway. I love the blog – thanks for all your tips. I also started following your sister's – you two are so cute! I´m Sandra and I read your great blog from Madrid, Spain. Thank you so much for your ideas, I use your tips to go to my office (I´m a future lawyer). Love your blog! I also found it on Pinterest and have been following for awhile. It was one of the blogs that inspired me to start my own style blog. Love that you show Florida winter wear! So many cute clothes we Floridians could never wear on other blgs! Great blog, read it everyday! I love your blog, you have some great ideas. Thanks for helping a fashion-challenged gal like me! I read your blog everyday! Thanks! Very generous of you to have a giveaway! Your blog is the one that got me hooked on following you fashion geniuses…….loved sister week! Yay! I also read your blog daily. So generous of you! I'm really enjoying your blog! I'm new to the post, but love it. Thanks for all the great ideas; they are making my limited wardrobe seem limitless and lots of folks complement me on my “new” outfits. I'm preparing to start a new job that requires more professional dressing than I am used to. I am scouring your blog for inspiration! Thank you for posting. I love your style! This was one of the first fashion blogs I started following! Love the blog! Super helpful for those like me in their first “real” jobs! Thanks! i think i started following you a year ago. love your posts! and thank you for the giveaway! I really enjoy your blog! Your style is very similar to mine, and I'm on a budget, so it's nice to see how I can re-work pieces in my closet and my suitcase! I travel for my job during the fall, and your Suitcase posts really help me out! I just started a corporate job where I have to wear grown-up clothes 5 days a week – your blog has been very helpful with giving me ideas for getting myself dressed every day. Thanks! Happy New Year! Love your blog so much! What a generous giveaway! I follow you on Pinterest as well. I like that you show simple basic pieces that many of us have already, but put it together in such a way that I never could! Thanks for the inspiration! MK, I cannot tell you how many mornings you have saved my mental sanity with your outfit posts! There are mornings when I open my email, see your daily email, and say “Hey, I totally can wear that.” And recently, with your collection posts, it really has helped me put more outfits together! 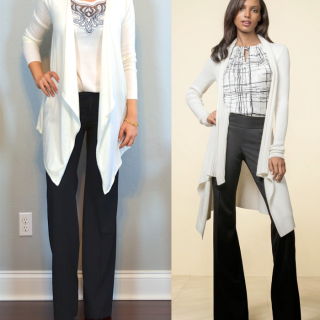 I love your 2013 recap- you make getting dressed easy and fun again! Way to go on 2 Years! Thanks for keeping up with it everyday! Love your blog and all the inspiration it gives me! Love, love, love your blog! I check it almost every day and get lots of inspiration! I tried to comment three times through the Feedly app on the iPad and accidentally closed the page each time. First world problem for sure, but here I am on a lap top where things are done more easily! I love your blog so much. I really appreciate that you focus on the clothes and don't add a different necklace to every single outfit and that you don't seem to own 9,000 pairs of shoes, making it difficult to recreate your looks. 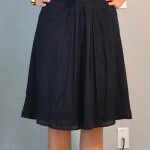 My favorite item that you own is definitely the navy and white skirt! So very cute! This site is my style bible, you keep it real and I love the shopping options. Keep going. Congrats on your 2nd anniversary! Love to get fashion ideas from you! Thank you for sharing your great sense of style! Your blog has helped and inspired me over the past year or so, thank you for all you do here! I love your blog! Your One Suitcase series helped me fit two weeks worth of outfits into a carry on for my trip to Italy. Thank you! Congrats!!! I love your site! What a great contest! I am really enjoying your site! I am travelling to a beach destination shortly and I will definitely use your “One Suitcase” as a guide! Keep up the great posts! Thanks for providing so much inspiration! I recently went to Disney and hadn't flown in a REALLY long time. Your posts on How to pack your carry-on and One Suitcase- Beach Vacation were such a big help! Keep up the good work AND CONGRATS ON TWO YEARS! Your blog is the only one I follow religiously! I've built a whole wardrobe around your posts. I wish you could just be my personal stylist, your outfits are classic! Keep up the amazing work! I love love love you blog! Found it through pinterest and never left lol. Love your outfits- thanks for the chance to win! I have been following you for a long time, great blog. I look forward to outfit post email every morning. Hi, I love your style ! You have a great blog. Love your blog!! Keep up the good work! Love your blog and your looks!! I love to follow what you do each day. Thanks! I just started following a few months ago and I love your outfits. Definitely my style except I can't wear mustard yellow. Oooh! A giveaway! Love it! LOve your posts! You have me shopping my closet again. Wow thanks for the give away! I love browsing your pictures… they help inspire me! This might be a silly question, but is the gift card for a particular store? I loooove your blog! Thanks for this giveaway! Good luck everyone! Love you blog so much, probably my number one site when I need inspiration! love your blog…. have put some of your posts on my pinterest boards ….congrats on 2 years. I have followed for a long time and I always look forward to seeing your name pop up in my email. I have even gone out and purchased a few new items after seeing some of your posts! I remember specifically buying a bright pink sweater to wear with my black skinny jeans, something I wouldn't have bought before, but it has become a go-to outfit! Thanks so much for doing this! Well since commenting gets a vote I thought I'd post my little story about finding this blog. So I wanted to say a big thank you for all the hard work that goes into this blog. Its such an encouragement to see what outfits you come up with. Your One Suitcase Series caught my eye. Now, I check in to find business and casual outfits. Congrats! Hope I win! Congrats on two years! I love your website and use it for inspiration!! Love your blog! You've really helped me get my work wardrobe together. DANG GIRL!! 3 $100 gift cards is awesome! I have been following you for a while and I love your looks, thanks for all of the inspiration! Your blog is great! I have pinned many of your outfits to my style board. Congrats on the anniversary! Love your blog! Love your blog and outfit ideas! Always inspiring! You make getting dressed in the morning so easy for me now! And I can't wait to use one of your trip capsules when we go to Hawaii, later in the year. Thanks!! Thanks for the great work solutions and inspiration! It's great to see professional, affordable and organized ideas. I check your site and the links are great for all ranges of similar/same fashions. Thanks for doing this! You've really inspired me to get out of a fashion funk and back into the fun! I especially like how you provide direct links to purchase the clothes. Great work! Love your blog! It's really helped me revamp my work wardrobe! The readers really come out of the woodwork for giveaways, eh? Congrats on two years. Love the blog! Planning a trip to Bali in July and will definitely use your packing tips to help me out! I always over pack and will use your tips to avoid that. Love your blog! Thanks for your hard work. I love your site and have been following for about a year, give or take. You're great inspiration! Thank you so much! I love your blog. I work in a conservative company and your blog is a total inspiration! Almost all of your outfits (work ones, that is!) fit with our strict dress code, which is so incredibly helpful. I love visiting your blog. I have gotten great ideas about combining things I already owned. So fun! I'm a new reader, but I think you have an awesome style. I notice that you really like the Express Editor pants – I'm a big fan of the Columnist pants! yay for a giveaway and yay for your oldnavy purchases! i just got the same sweater and a chambray shirt – can't wait to see what you come up with! Love your blog, it helps me shop my own closet and put outfits together I never would have considered! Thanks for great outfit ideas ! I love your one suitcase series!!! I've adopted my everyday wear and have a capsule wardrobe for each season now. Thanks for all the great ideas! congrats on 2 years. Your “capsules” are my favorite. I love to see you to take style pics and actually make them wearable! So sweet! I live in Florida too! Awesome to have a style blog perfect for our weather! Hi, I love your blog. I have it on my favorites and visit every night for inspiration on my next day's outfit. After years of hopeless buying of one hit wonders that did not match anything else in my closet, you have shown me how to shop my closet by adding the basic pieces I was missing. Thank you so much for making it easier for clueless girls like me. Your blog gives me THE BEST ideas. I love it. I use your blog as inspiration as I transition to the office. I can't believe you do all this while staying home! Thanks! Thank you for your time and hard work. The outfits you put together are really inspiring. Every day it is a true delight to see what you have put together. WOW what an amazing give away you have offered! I discovered your blog after I graduated from college and I needed new ideas on how to dress when working in a corporate business. Thank you! I just showed your blog to a friend of mine and she loves it too! I love your one suitcase posts. It's inspiring to see you make so many outfits out of only a few pieces! Thanks for giving outfit inspiration to so many of us! Thank you for giving outfit inspiration to so many of us! HI!!! THANKYOU! Just found your blog…will be coming to visit often. You really put so much effort into keeping this blog fun and current. Thanks for the hard work…and giveaway! I sooooo want to win this – I've recommended your log to so many of my friends!